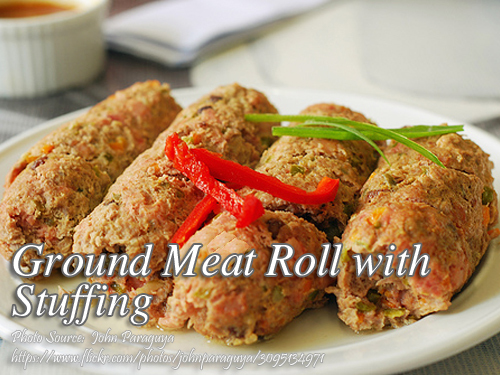 This recipe, the ground meat roll is made out of ground pork and stuffed with cheese, spices and relish. Making of this meat roll is simple. You just combine the meat mixture made from ground pork, egg, flour, pepper and Worcestershire sauce. Then lay it flat on the rectangular pan, spread the stuffing mixture then roll it like a jelly roll to create the meat roll. Wrap it in an aluminum foil then cook it. There are 2 ways on cooking it, you can either bake it in the oven or steam it. What ever you choose, they are both good because it has less fat compared to frying. Line a rectangular pan (6" x 14") with foil or wax paper. Spread the meat mixture (1st layer ingredients). Press and flatten evenly. Spread second mixture on top of 1st mixture. Press tightly. Then as in a jelly roll, roll up tightly and wrap in foil. Chill in a refrigerator for several hours or overnight. Bake in a pre-heated oven, with 350 °F heat for 45 minutes or, steam-bake for 1 hour. You may serve whole or sliced thickly. Make gravy out of the drippings. Thicken with 1 Tbsp dissolved cornstarch or flour.